Hey, I am Bethany, the Head Instructor at Flex Movement Lab. About 5 years ago, I was a very consistent gym goer. Loved weights; lifting heavy and cardio…wasn’t much into the group fitness thing. And yoga…while I had practiced it, held zero interest for me. It wasn’t ever “intense enough” and I had never walked away from a class feeling “worked”. As it happened, that was going to change. I was deadlifting one morning and right in the middle of my set I felt a tweak, for lack of a better word. It was just enough to feel uncomfortable, but not enough to make me stop. I worked through the pain, literally a 10 hour serving shift on my feet. When I got home that night and sat down, I realized I could not stand back up, the lower half of my body would not move. Then came the excruciating pain. I can’t explain what a strange sensation it is to literally know that your brain is giving the cues for your legs and feet to move and to stare at them and not have yourself walk. It was determined that I was suffering from temporary paralysis. I had done some damage to the nerves in my spine due to incorrect form. It took me a couple of weeks to get back into the gym, and even then…It was very slow going. And by that I mean I was able to walk on a treadmill. Very, very slowly. The incredibly slow recovery was hard to accept and I was incredibly frustrated, but what I did realize was that I had done some serious damage to my body and I never wanted to put myself in that position again. I needed to rethink how I was working out. I talked to a good friend, Summer Huntington; who has her MS in Kinesiology. She had recently founded a program called Clubbell yoga and had been encouraging me to try it even though I had resisted due to my idea of yoga. After talking with her and explaining what I had done to myself and where I was at we decided that Clubbell yoga would be a good place to start. A few days later I walked into my first Clubbell class. 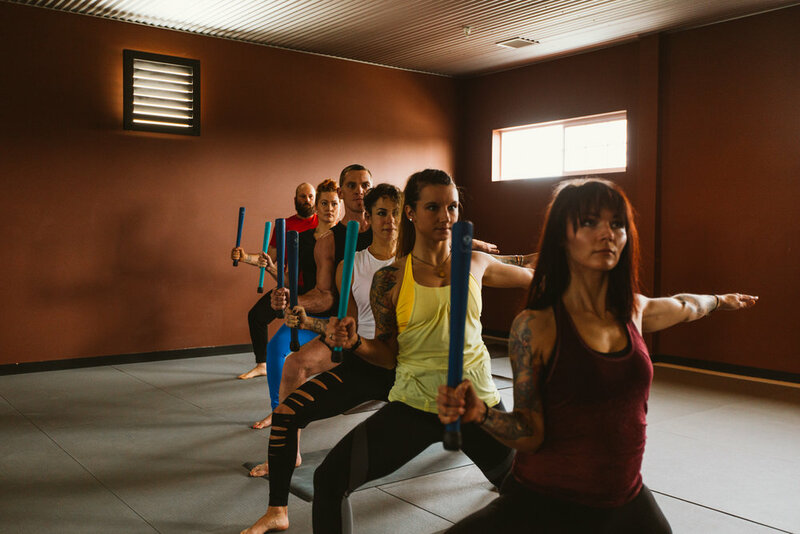 I took it slow but as I made it to practice more and more frequently I began to notice my strength coming back into my body, stamina and endurance increasing and my core was getting stronger with every practice. That was just the beginning. The changes I was seeing were amazing and so exciting. From there, I pursued a teaching certificate and my passion for power yoga followed shortly after that. I love both practices – but truly the benefit that Clubbell brings transcends into every movement I choose. So now, I chose to teach because I have personally seen the benefits of what this practice brings to the table whether the cross practice is another body weight modality or traditional body building. It truly doesn’t matter what you are into – the benefits that you will experience from this practice will now only add to your life but will strengthen it. That’s a promise that I absolutely stand behind. Leading a clubbell class with some of our regulars!